Occasionally I watch interactions between different people. Example A is two males that sit next to each other at a bar, The males are watching football and one thing leads to another and their having a great conversation about their favorite team. Example B two females sitting next to each other at a bar. The females eye each other secretly checking each other out making weird faces at each other as they turn their face to hide it The reason I brought up this example is to show how hard it is for females to get alone with each other and how easier it is for males. 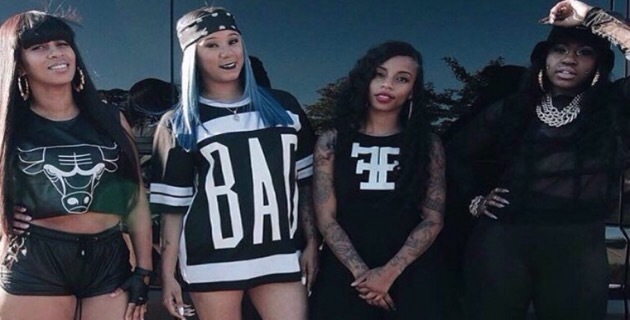 Why you may ask…competition.I may not be the biggest fans of these ladies but I’m proud of Katie Got Bandz, Sasha Go Hard, Chella H, and Lucci Vee for showing us that networking can be down. It’s rare for me to see a group of ladies collab on anything. I’m very open to growing my network while meeting new people. I’ve watched the beef between Nikki Minaj and Lil Kim for years. I wonder what magic they could make in the studio if they put their beef to the side. I bet it would be dope. Will we ever see it? I’m a firm believer in women sticking together to win. 2015 into 2016 I will be reaching out more to other females not only rappers. I hired a PR out of Atlanta Nikey “Tru Missez” Pasco a month ago, She is beyond dope. Believe it or not she’s a rapper too and I really enjoy her work. Who would think another female rapper promoting another female rapper. She showed me the power of sticking together. Her work for me alone brought numbers to my network I’ve never seen before. Great minds don’t think alike. Great minds come together and make differences in the world! I am not surprised at this blog post from you because you are also a very empowering woman. I happily promote and market other female artists because I want to see us all win. There’s no shade over here. I look forward to continued business with you and possibly even a collaboration because I enjoy your work too! Big up Queen E!